This article is part of The Immigrants’ Civil War. The Know Nothing Party sprang to life in the wake of the massive immigration from Ireland and Germany that began in the seminal Year of Revolutions, 1848. But it had its origins in hatreds bred before the founding of the Republic, before the first English ever settled in America. Anti-immigrant movements have never been simply reactions to the arrival of newcomers. They form around a fear that a group of foreigners are so unlike ourselves that they threaten to destroy that which we hold dearest. American Know Nothingism had its roots in anti-Catholic propaganda promulgated by the English crown from the days of Queen Elizabeth and transmitted by evangelical preachers in every corner of the British colonies. There were still very few Catholics in America, but evangelical ministers worried that secular Americans were more willing to associate with papists than they were with fire-breathing Protestants. One symbol of this danger was a convent near Bunker Hill in Massachusetts. The tide was rising against immigrants in 1840. Americans had expected new immigrants to give up their old ways and become fully American. What they found instead was that Germans continued to speak German and that the Irish refused to make the most basic concession and adopt an American religion. The actions of the leader of New York’s Irish immigrants, Bishop John Hughes, heightened the crisis. 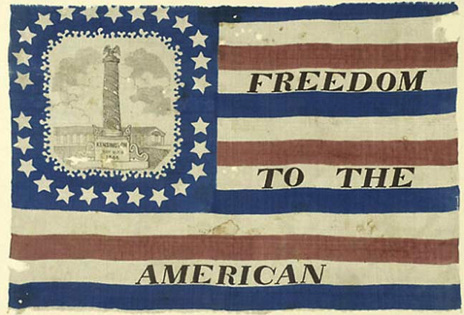 Nativist flag from the years before the Civil War. New York’s public schools instructed students in Protestant religious beliefs, which were then considered the beliefs of all true Americans. The Protestant King James Bible was used as a daily text and classes taught the evils of Catholicism. Irish parents resisted this effort at Americanization, and thousands of their children were kept home from school. 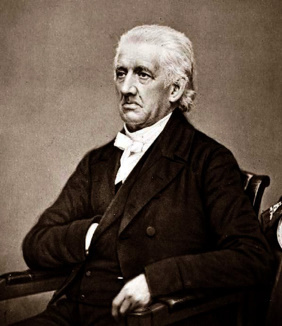 Irish-born Bishop Hughes initially sought a compromise with Protestant New York. He asked that Catholic students be taught their lessons from a Catholic translation of the Bible, and that they be excused from Protestant religious instruction. When this was refused, he demanded the secularization of public education. Until the late 1840s, native-born American apprehension of immigrants was largely based on ignorance and fear mongering, but by 1848 massive waves of immigrants began to arrive. And tens of thousands of the new arrivals were Catholics. Famine drove emaciated, diseased, and illiterate Irish peasants, a third of whom did not speak English, to America. It was as though the nightmarish predictions of Puritan sermons had all come true. The ignorant slaves of a foreign potentate had arrived in the land of Washington and Jefferson and they appeared to be demanding that America change to accommodate them. It didn’t help that the Irish were followed by the Germans, many of whom were either Catholic themselves or, perhaps worse, religious agnostic veterans of the 1848 revolutions. The changes the newcomers wrought were apparent every Sunday in any village in which they settled. Americans were used to celebrating the Sunday Sabbath with hours of worship in church followed by still more hours of quiet prayer and Bible study at home. Many Germans, however, observed the Continental Sabbath, meaning they might spend an hour at church (or sleep through services), but their main activity on Sunday was a combination of beer drinking and strange physical maneuvers called “gymnastics.” The Irish, on the other hand, rarely missed church, but followed religion with wild dances in which tribal music was played and men and women jigged, often in the company of blacks. This immigrant behavior disrupted the Sunday quiet decreed by the Bible – and it enticed young Protestants away from the faith of their fathers. This fear was compounded by alleged criminality and sexual immorality among the foreign born. Nativist activists began organizing mass meetings throughout the country attended by thousands of men. The meetings, rich in prayer, often ended with physical attacks on German or Irish immigrants or with the burning of a Catholic Church. Secret paramilitary societies were formed to fight the immigrant invasion and to beat back the cultural incursions of Ireland and Germany on America. They also provided security for preachers from angry immigrants who might try to disrupt nativist prayer meetings. Additional resources: An online archive of material about the burning of the Ursuline convent is available at The Ursuline Covent Collection. 1. The Protestant Crusade 1800-1860: A Study of the Origins of American Nativism by Ray Allen Billington, Quadrangle (1938) p. 8. See also, In the Devil’s Snare by Mary Beth Norton for an intriguing discussion of the association in the Puritan mind of Satan, Catholicism, Native Americans, and the American wilderness. Norton argues that this view was a contributing factor to the Salem witch hysteria. In Entertaining Satan: Witchcraft and the Culture of Early New England, John Demos, discusses the possible association of the Irish with witchcraft in the minds of the Puritans. 2. The Protestant Crusade 1800-1860: A Study of the Origins of American Nativism by Ray Allen Billington, Quadrangle (1938) p. 11. 3. The Protestant Crusade 1800-1860: A Study of the Origins of American Nativism by Ray Allen Billington, Quadrangle (1938) p. 18. 4. The Protestant Crusade 1800-1860: A Study of the Origins of American Nativism by Ray Allen Billington, Quadrangle (1938) p. 35. 5. See generally: The Age of Federalism: The Early American Republic, 1788-1800 by Stanley Elkins and Eric McKitrick, Oxford University Press (1995). 6. The Protestant Crusade 1800-1860: A Study of the Origins of American Nativism by Ray Allen Billington, Quadrangle (1938) p. 43-46, 53. 7. The Protestant Crusade 1800-1860: A Study of the Origins of American Nativism by Ray Allen Billington, Quadrangle (1938) p. 69. 8. The Protestant Crusade 1800-1860: A Study of the Origins of American Nativism by Ray Allen Billington, Quadrangle (1938) p. 68-90. 9. The Protestant Crusade 1800-1860: A Study of the Origins of American Nativism by Ray Allen Billington, Quadrangle (1938) p. 68-90. 10. The Protestant Crusade 1800-1860: A Study of the Origins of American Nativism by Ray Allen Billington, Quadrangle (1938) p. 88. 11. The Protestant Crusade 1800-1860: A Study of the Origins of American Nativism by Ray Allen Billington, Quadrangle (1938) p. 89. 12. The Protestant Crusade 1800-1860: A Study of the Origins of American Nativism by Ray Allen Billington, Quadrangle (1938) p. 122-128. 13. The Protestant Crusade 1800-1860: A Study of the Origins of American Nativism by Ray Allen Billington, Quadrangle (1938) p. 145-155. 14. The Protestant Crusade 1800-1860: A Study of the Origins of American Nativism by Ray Allen Billington, Quadrangle (1938) p. 322.